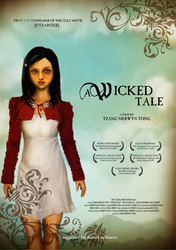 Noc Vvyne was commissioned to paint the lead character Beth for the publicity release and film poster of the multi-award winning film A Wicked Tale. In 2009 there was an event of a double screening of films by INRI Studio and she was once again commissioned to alter the original image of Beth. Her illustration on A Wicked Tale had been described as "the Mona Lisa" of her works.